Offering you a complete choice of products which include lab equipments. Small scale studies and quality control. Laboratory cleaners are used for processing and cleaning of seed and grain in small scale studies. Basically, laboratory seed cleaners can simulate the job of big scale equipment in terms of functionality and quality of output. 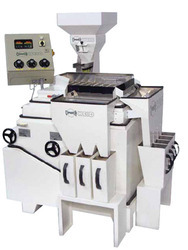 Therefore it can be used for testing and sampling in order to assign quality of seed and grain itself in small scale tests and/or to assign right adjustments for big scale machines (f.e. required screen perforations, indent sizes etc.). Furthermore Cimbria Lab equipment can be ideally used also for applications with very low hourly capacity- demand. This goes specially for processing and cleaning of high value seed like vegetable seed. Coating of small amounts of grain by Laboratory Batch Treater (CC LAB), Batchsize: 2kg (based on wheat).